Fill the heat-resistent test tube approx. 1 cm high with calcium acetate. Clamp the test tube steeply or vertically onto the stand, apply the rubber plug with discharge tube so that the discharge tube opens into a test tube which is in a beaker with cold water. In order to avoid blowback the end of the discharge tube should end a goodly distance from the bottom of the apparatus. Strongly heat the test tube containing the acetate with the gas burner, even until the glass begins to glow red. Take care that the acetate is heated from all sides. A carbonization occurs, the mass becomes solid and possibly rises somewhat in the test tube, which does not disturb the reaction. 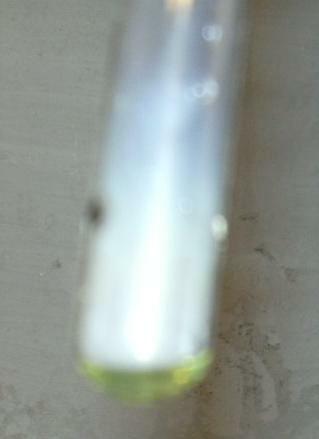 A clear, but not completely colorless distillate develops. Interrupt the heating as soon as all of the lime has been thoroughly heated and hardly any distillate develops. The distillate consists of, apart from the dissolved water, acetone. This one can recognize by the smell, which seems, however, quite burnt. One can also carefully test the inflammability of the distillate. All residues are harmless and can be discharged into the drainage, one can also dispose of the lime in the household garbage. If the removal of the lime deposits proves to be difficult one can apply a diluted acid. Apparatus for the pyrolysis of lime. The newly produced acetone is clear, but yellowish.